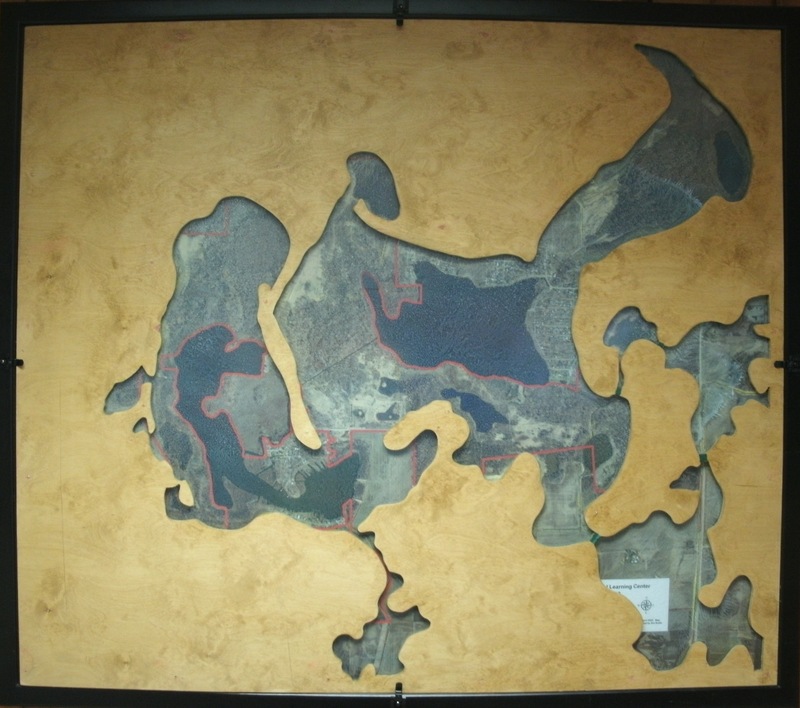 This map of Merry Lea shows areas underwater before European settlement. 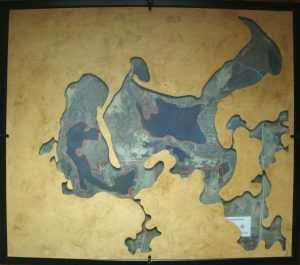 While over 65% of Merry Lea was historically submerged under a kettle lake during the immediate post-glacial period, there were (and continue to be) higher elevated landforms. These include glacially-formed eskers and kames and a system of wind-deposited sand dunes between what is now High Lake and Bear Lake. This ancient dune system’s well-drained soils dry out quickly, thus limiting tree cover to black oak and white oak— species that tolerate limited water availability. Competition for water results in tree cover that is sparser than that of close-canopied forests. The partially sun-lit conditions promote the growth of the native herbaceous prairie species that can tolerate partial shade. These pre-European settlement ecosystems were most likely oak woodlands and savannas. These dry-site plant communities were most likely maintained by periodic fire—naturally-occurring or ignited by Native American peoples who were known to inhabit this site. The 1919 State Archeological Survey describes evidence of their presence on a ridge near Luckey’s Landing. As the human population increased after the 1830’s, agricultural production became a dominant land use. Fire suppression efforts protected property and crops. The steeper portions of this tree-covered ancient sand dune system were likely only grazed by domestic livestock. The livestock maintained the open-canopied conditions by browsing on shade-tolerant woody species that would have eventually encroached due to the absence of fire. But long-term intensive grazing degraded the highly erodible sandy soils. It also reduced the abundance of native herbaceous understory plants, as introduced non-native forage species were better able to withstand the grazing pressure. Selective grazing on many native species by domestic livestock provided competitive advantage to woody native species that bear thorns (hawthorn and prickly ash) and woody non-native species (multiflora rose). By late 1960’s all grazing ceased on these sites. Without periodic fire or continuous grazing, the understory of these open-canopied stands of trees quickly filled in with shade tolerant species of native and non-native species of woody plants. Hawthorn, eastern red-cedar and invasive shrubs (multiflora rose, autumn olive) increasingly occupied the sunlit openings between the overstory trees. Most of the remnant native herbaceous ground cover (i.e., bottlebrush grass, little bluestem grass, butterfly milkweed) began to disappear while non-native forage grass species, such as fescue, brome and bluegrass, increased.